How can I change my password or the answer to my security question? You can log in to your mailbox from any device connected to the internet. Type mail.yandex.com into your browser's address bar, enter your Yandex username and password, and click Log in. Tip. To access Yandex.Mail as quickly as possible, add the Mail page to your bookmarks or make it your browser's home page. You can also set up handling mailto links. Note. If you have connected to the internet from someone else's device and do not want the browser to save your username and password, enable the Do not remember me option on the authorization page. Your session is terminated when you close the browser or 2 hours after your last operation in Yandex.Mail. If you want to log in using your social network profile (such as Facebook), you have to grant Yandex access to your personal information. Note. Yandex needs to access your social network profile in order to link it to your mail. Yandex will not use your profile in any way without your consent. See the Log in to Yandex section for more details. You can select an account in Mail, Passport and other Yandex services that support this feature. The selected account is considered the main one: using it, you will be authorized on services which do not yet support switching. No more than 15 accounts can be added to the list. To remove a certain account from the list, switch to that account and click Log out. The current account will disappear from the list, and you switch automatically to the next one. To remove several accounts from the list, click Add user and then Edit list. Then click to the right of the account that you want to remove. Open your account menu in the upper right corner of the screen and click Log out. 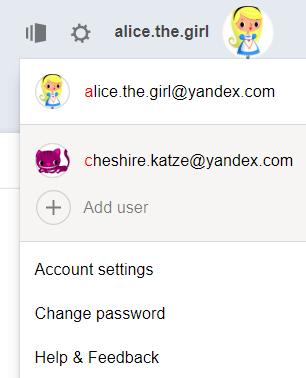 If you forgot to log out of Yandex.Mail on someone else's device, open your Passport page, find the Account security section, and click Log out on all devices in your account menu. Attention. To log in to Yandex services again, you will have to re-enter your username and password on each device. For security reasons, it is recommended to change your password every 6 months. 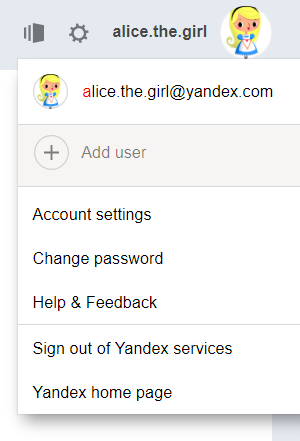 To change your Yandex password, open your account menu in the top right corner of the screen and click Change password. Enter your current password and enter your new password twice for confirmation in the page that opens. Enter characters from the picture and click Save. Attention. After your password is changed, all sessions on other computers initiated with your username will automatically be ended. If you forgot your password, follow the password recovery procedure and specify your Yandex username or email address. You can recover your password by answering the security question, through SMS to your secure phone number or secondary email address. You can change your security question or answer on Yandex.Passport by clicking Edit your security question/answer.